Bryn Williams, chef-patron of Odette’s was born into a large farming family in north Wales. He learned to cook at the apron-hems of his mother and grandmother so, as he says in Bryn’s Kitchen (pub. Kyle Cathie, 2011), it’s no wonder his family are important for “they have shaped my thoughts on our responsibility to the land and on good food…In Welsh we have a word – hiraeth. It describes a feeling of belonging – to a place, to a person. It’s where you are from, it’s what you are about. We are all caretakers of the land we live off.” Homespun family values that match those fostered by Transition Towns, so welcome to our website Bryn. His book (£25, or £20 if you are dining at Odettes) features twenty ingredients in twenty chapters, each offering five treatments – a generous hundred recipes. Bryn cooked the fish course for the Queen’s 80th birthday banquet, but remains a country boy at heart, and it is, he says, “impossible to live on a farm without eating game…it’s part of rural currency – a brace or two of pheasant for a basket of logs.” His delicious autumnal recipe for venison below comes from his book. Venison loin steaks come as little columns of lean meat for peppering and slicing to serve in medallions. Season venison loins with salt, then roll each one in crushed peppercorns until evenly covered. Put the oil in a heavy-based frying pan over medium heat. When it is hot, fry the pieces of venison for 3-4 minutes on each side, until the meat is firm to the touch, but springs back when you press it with your finger. It should stay pink in the middle. Remove from the heat and set aside in a warm place to rest. Melt a third of the duck fat in a heavy-based saucepan over medium heat. Add the carrot and celeriac batons and cook until tender. Strain the vegetable batons through a colander, draining the fat into a heatproof bowl. Return the saucepan to the heat, add the remaining duck fat and cook the shredded cabbage for a few minutes, until the ribbons begin to wilt slightly. Add the carrot and celeriac batons and cook for another 3-4 minutes. Strain the duck fat into a heatproof bowl. Return the pan to the heat and pour in the cream. Let it bubble slightly, until the cream lightly coats the cabbage. 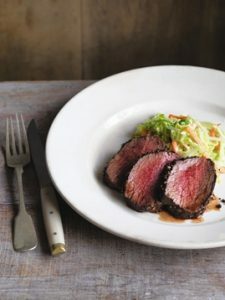 To serve, slice the venison and place on large, warm plates with the creamy cabbage to one side.